It's time for another Bout of Books read-a-thon! This one goes from January 7 to 13. 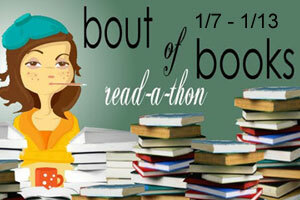 Check out the Bout of Books site for full details and to sign-up! Here are my goals and my reading list, and once the read-a-thon starts I'll post daily updates at the bottom of this post. Read 100 pages a day! I occasionally do this, on a good day, so I'm gonna aim to do it every day during the read-a-thon. Comment on at least one other participating blog each day. Write at least 2 reviews during the week so that I'm not overwhelmed later. Here are the next few books on my to read list, which I'll probably be reading in this order. If I'm successful in my goal of reading 100 pages per day, I might get through the first three. More are listed in case of DNFs and/or suprisingly fast reading. Only 55 pages left in this book, so I'll be on to something new tomorrow. I did a bit better today! I think the pages of this book are a bit longer than the pages of the last one. But I think I'm picking up the pace as I get more into the story. So, I fell a bit short on my reading goal. The first few days I was strong, and then I went downhill from there. And while I commented a few times, I didn't comment every day. I did, however, get at least 2 reviews written this week, so I didn't fall behind! Now I have one week off before the next read-a-thon: A Winter's Respite hosted by Seasons of Reading! I love that goal of 100 pages a day. I hope I could get that one in too! Have a great day! Ooooh you have the uninvited already! That one looks so great! =) Have fun with your reading list this week! I'm enjoying it so far! That books seems to have a lot of publication dates; the ebook has actually been out since June! 128 pages in!!! Good job!!! You're off to a great start. :) I haven't heard of those books but I'm sure I'll be adding a few to my TBR list. Good luck with your goals and I hope you have fun. I have never heard of any of those books but good luck making your way through the pile! I'm slowwwwwwly creeping my way through Jane Eyre, but it's not going to be as quick as I remember from my last reading, I don't think! *sighs* I tell ya, I remember when I used to PLOUGH through books, now I can't read that fast or I don't remember a thing! Oh well... Happy reading as we come to the end of Day 2! I know what you mean. I feel like my reading speed has decreased, too. I hope that means I'm getting more out of my reading now! Good luck with your goals! 100 pages a day is totally doable. :) And writing reviews is a GREAT goal -- I was ahead and now I'm behind, so I know I'll be a little overwhelmed soon. I just recently got caught up on my reviews (right now I only have about 5 to write), so I really don't want to fall way behind again! 100 pages a day is such a great goal. I hope review writing works out. I've been slacking on that myself. Good luck this week. 100 pages a day is a great goal! You are doing so well. What a great goal of 100 pages a day! Also yay for writing a review during the week-I have 6 I need to write and I keep putting it off more and more. Gah I need to do them and not overwhelm myself. Good luck and have fun! i should have thought about this kind of goals but to be honest so far i would haved fail miserably ^^ things can't keep going in the way but today will be better !! i need to read!